With a record setting vote of 97.5million votes, David Cook took the title of Season 7's American Idol with 56% of the vote. I'm so glad Cook won, he was definitely the better of the two singers - he took chances - his songs didn't all sound the same. A few observations about the show, however... Watching the top 12 tromp across the stage during their choreographed dance numbers was absolutely hilarious. The vast majority of them seemed to have no rhythm and coordination whatsoever - it was absolutely laughable. I also now remember why I was so glad to see Amanda leave the competition - her voice is just verging on intolerable. Carrie Underwood did a kind of "rocker" country song, but I was terribly afraid her short little jacket of a dress was about to cause a wardrobe malfunciton any moment - I was nervous for her! The George Michael medley made it obvious that he was going to come out and sing.... OMG!!... how horrible does poor George look??... What happened??... I mean, I haven't followed George since, oh, around Band-Aid times, but... this was like a fat-elvis transformation - glasses and all!! So, from all of us here at Pink Lemonade, Congratulations, David Cook on your win - you truly did deserve it! Great post. I'm so glad David Cook won! He is much more marketable and I think he'll make some great music. I'm sure it's not the last we've heard from little David either. I have never been a big "idol freak" but this year my 6, 5 and 3 year old were soooo into it we really watched it as a family. I hated David Cook at first but soon realized his talent and was voting for him every week. My 5 year old, Audrey only liked the "girl singers" so she was disappoints when Shyesha was voted off. I am so pumped that I actually voted for the winner! Now its like I am a winner too, right? This was the first year I actually watched Idol all the way through to the end. 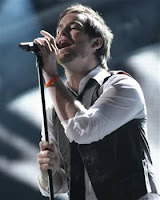 I'm glad David Cook won, he is really talented and deserved it. I love David Cooks singing! The song Time of My life really has a great meaning. So glad that he won! This is also my entry for the giveaways going on!